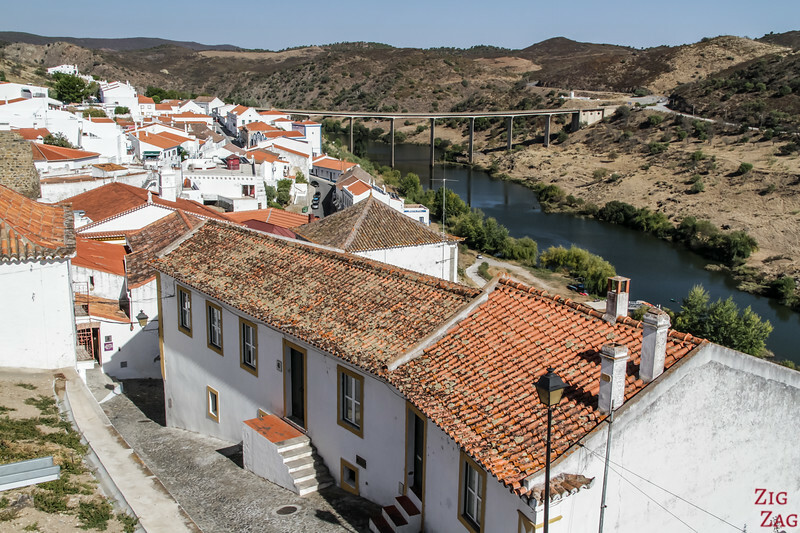 Off the beaten track, the village of Mertola Portugal is breathtaking with its river, castle and historical variety of architecture influences. 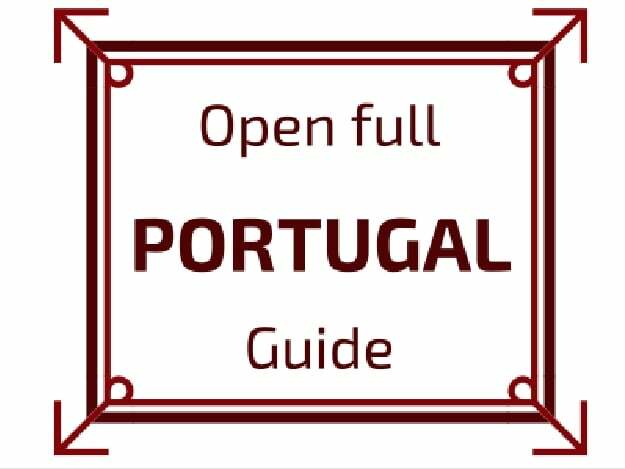 Let's discover it in video and photos. 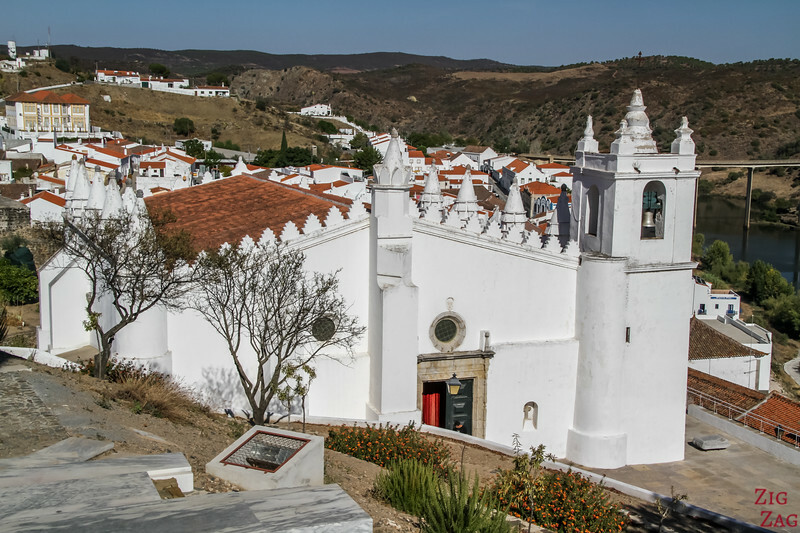 Let's start with a short video of my visit to Mertola Portugal with scenic views and the discovery of the famous Mosque /church and the Mertola Castle. 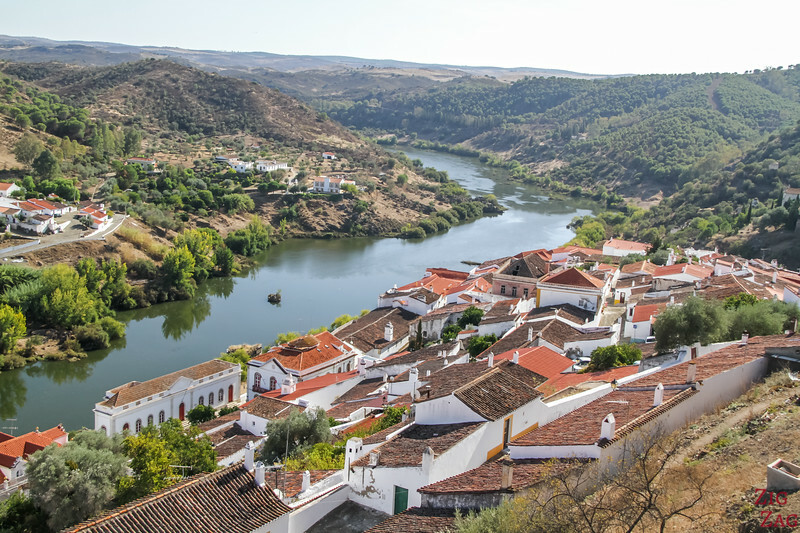 One of the best things about Mertola is that River Guadiana flows at its foot. 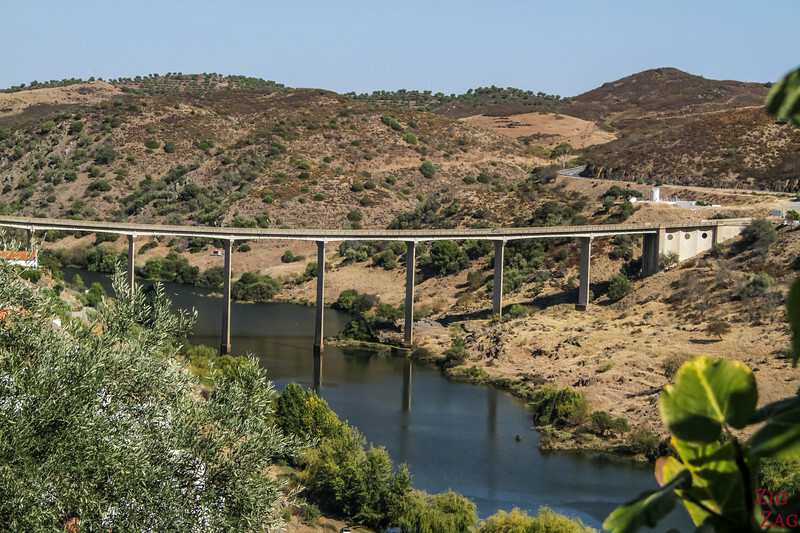 See the bridge in the picture below? 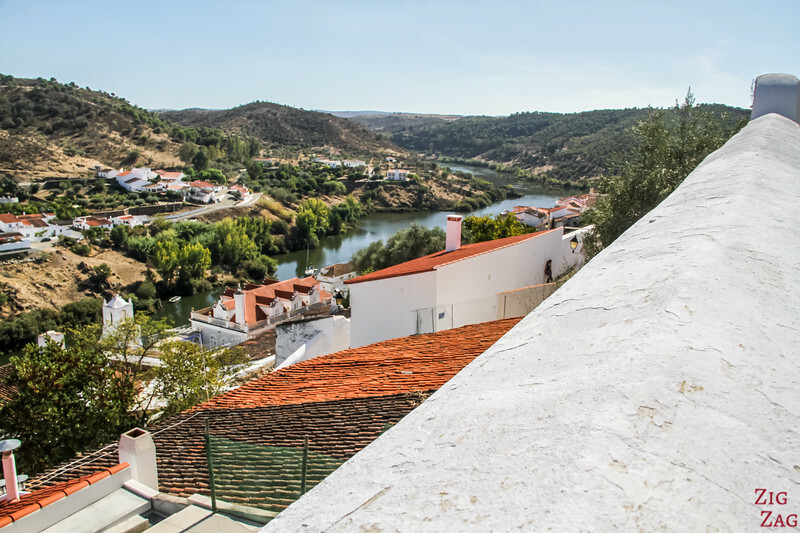 Well you can cross to the other side of the river to enjoy absolutely breathtaking views of Mertola Portugal. 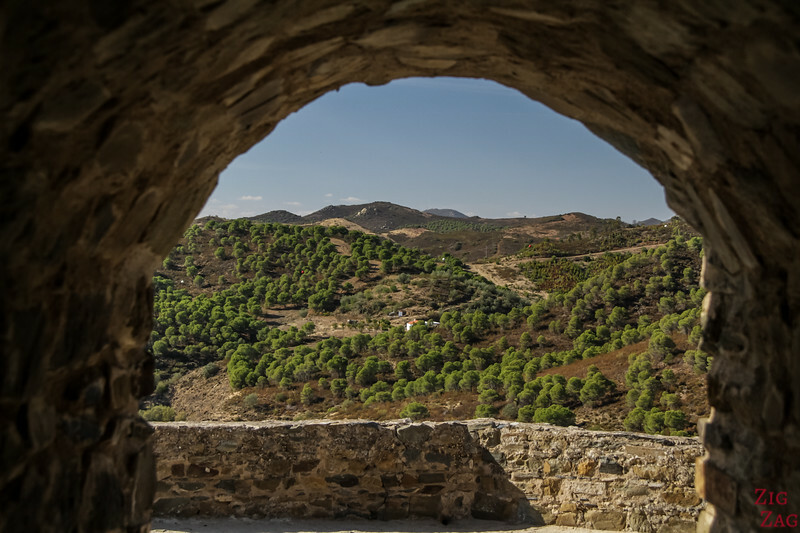 And below is the views you can get with the Mertola Castle at the top the and the church just under it. 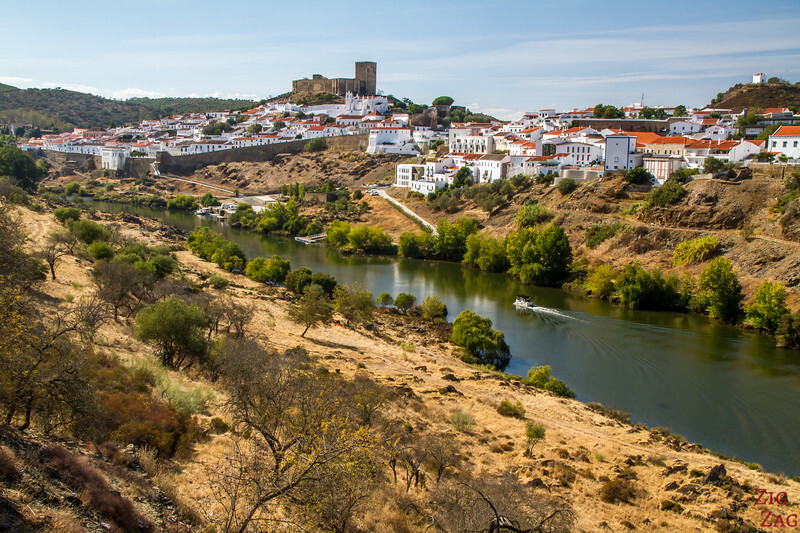 This is River Guadiana looking in the other direction from the bridge. 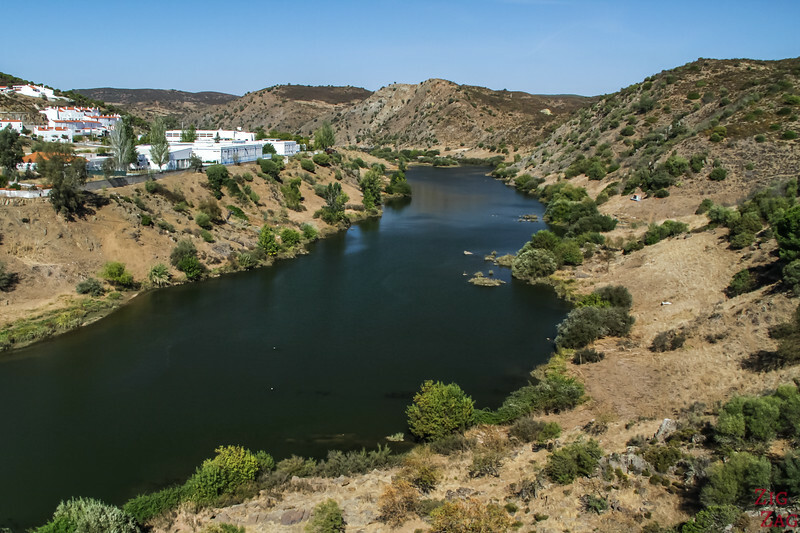 This is typical landscape of the Nature Park of Vale do Guadiana, of which Mertola stands in the center. 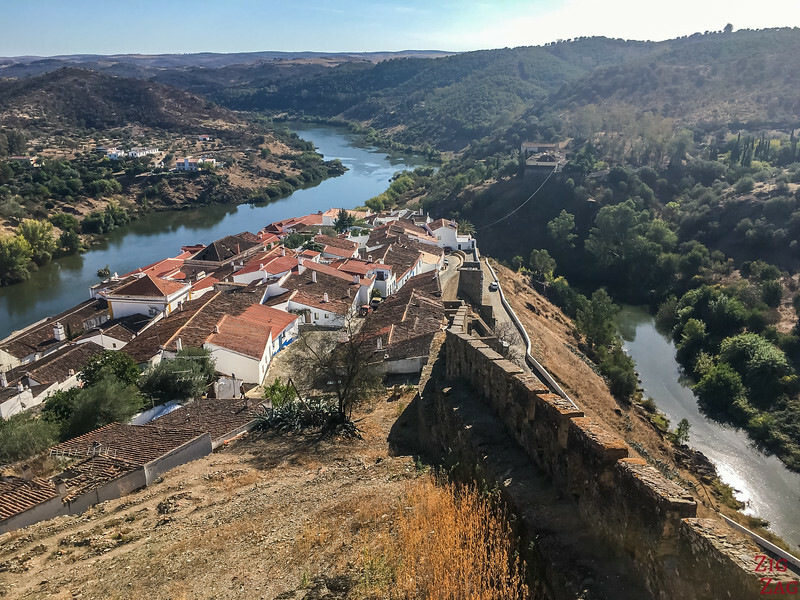 If you drive a little bit further along the river on the opposite side to the village of Mertola Portugal, you reach a small jetty with more views of the castle and the church, as well as the wall around the village. 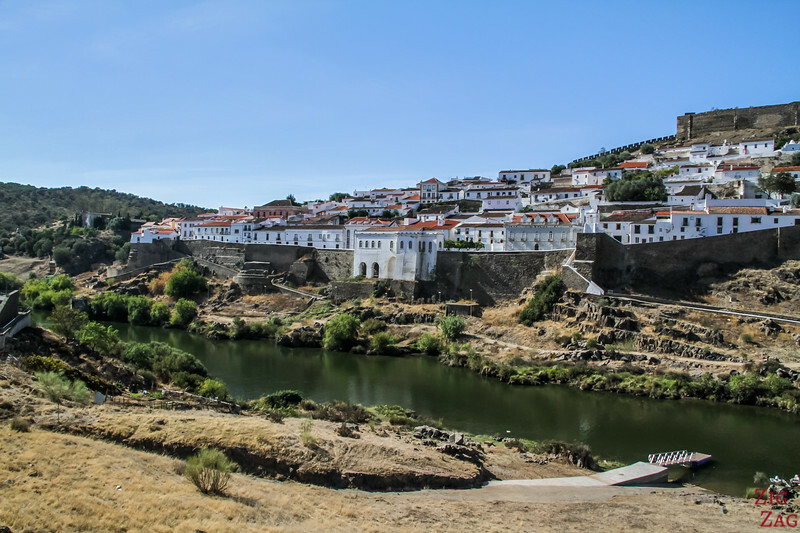 Mertola was definitively in my To﻿﻿﻿﻿p 5 best Villages in Portugal﻿ with Marvao, Monsanto, Obidos and Monsaraz. Do not try to get in with your cars, I have seen people get stuck! 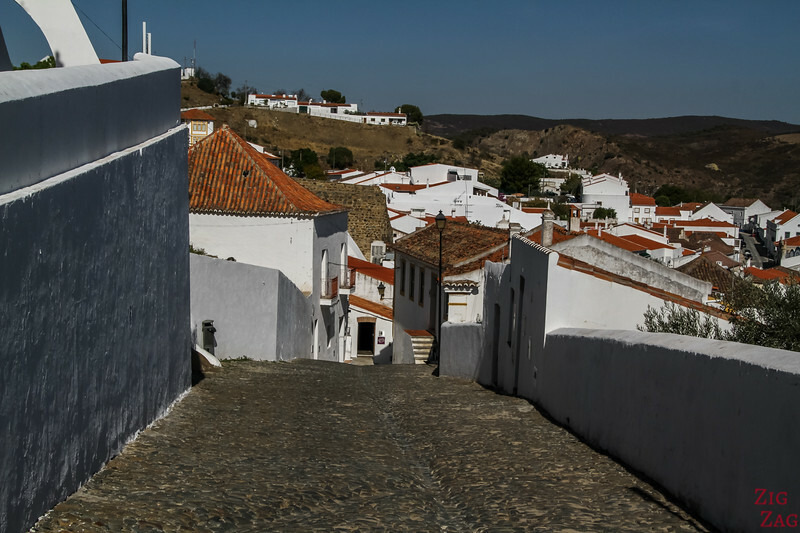 And, like in many of the Portugal villages, it has been built on a hill and walking inside is quite a climb 🙂 but with those white walls and views, it is a real pleasure to stroll inside. 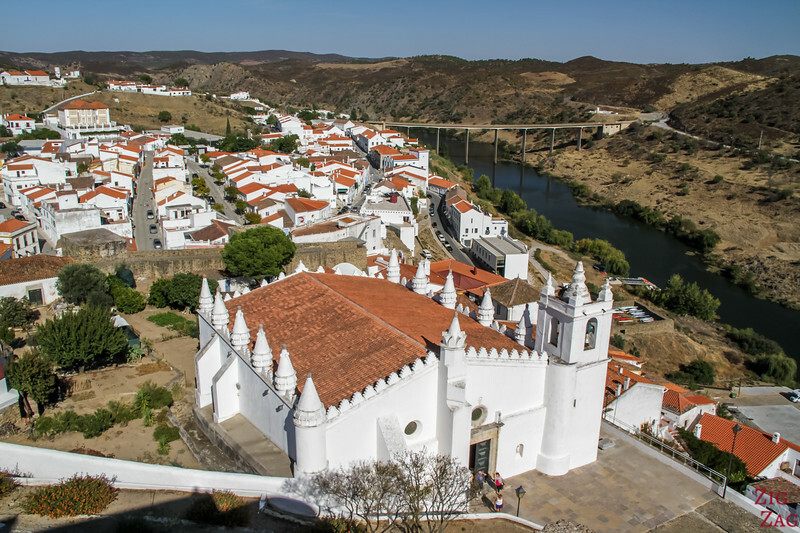 One of the best things to do in Mertola Portugal is to admire the unique church. 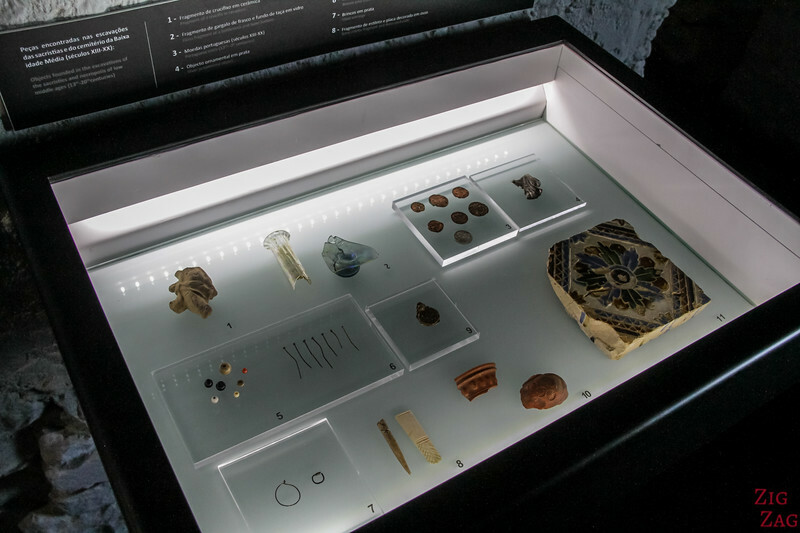 It has a long and complex history and a very unique style! 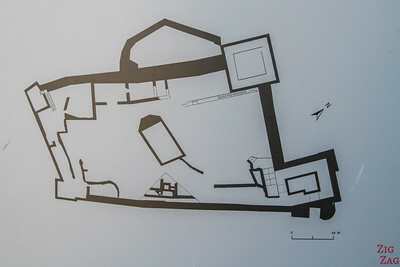 Originally its was a mosque. 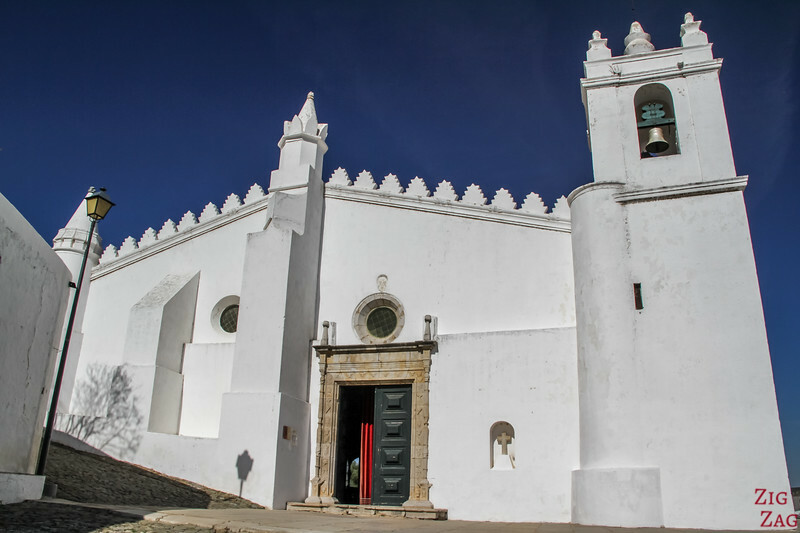 The Mertola mosque was erected in the 12th century. 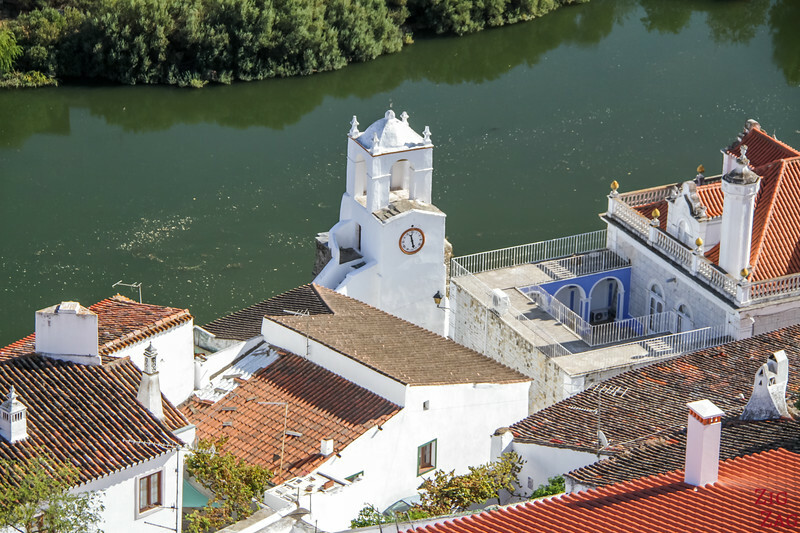 It is so unique to see this blend of architecture. 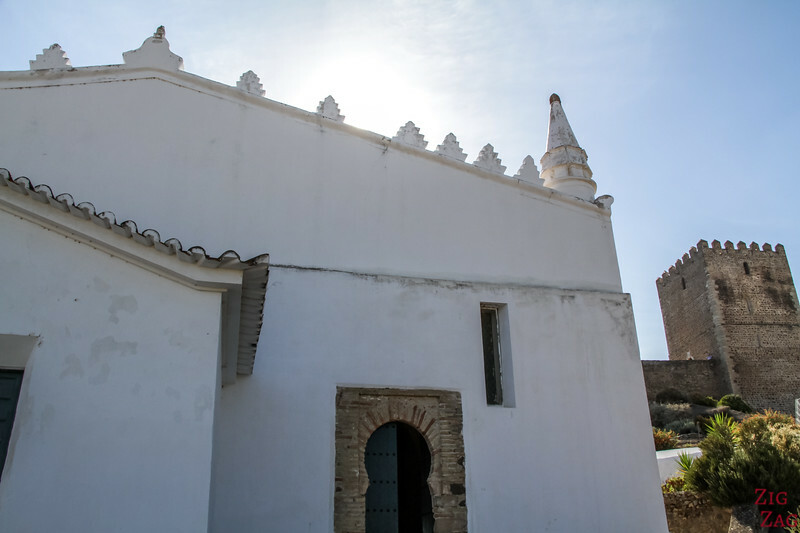 Look at the doorway reminding us this used to be the Mertola Mosque ! 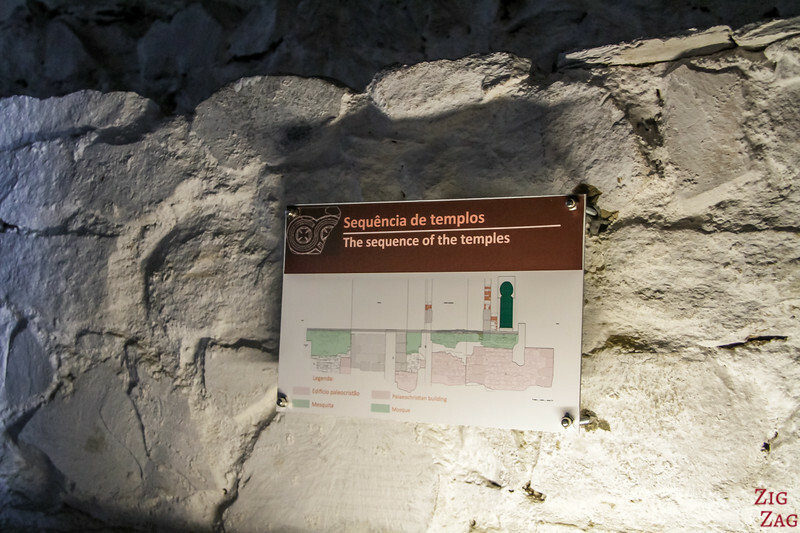 Inside the church you can see a sign about the Mertola Museum. The person in charge gave us access. 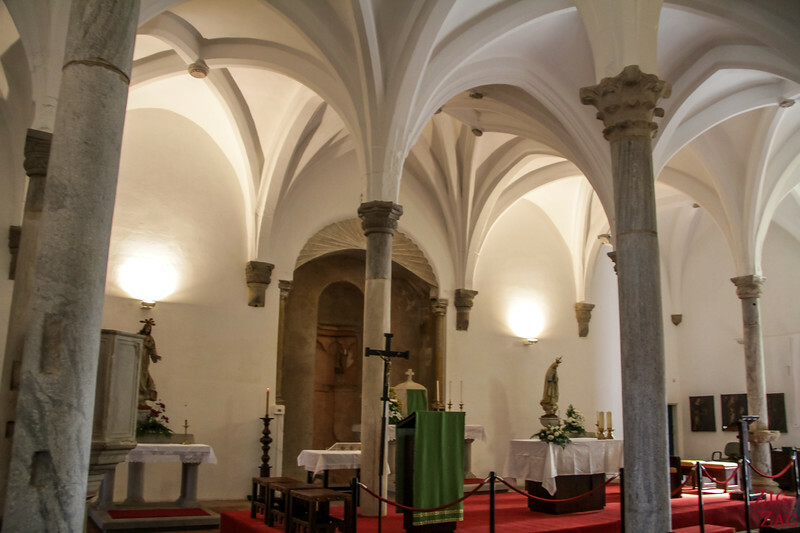 Located under the Mertola Church, this is a small but very well done museum. 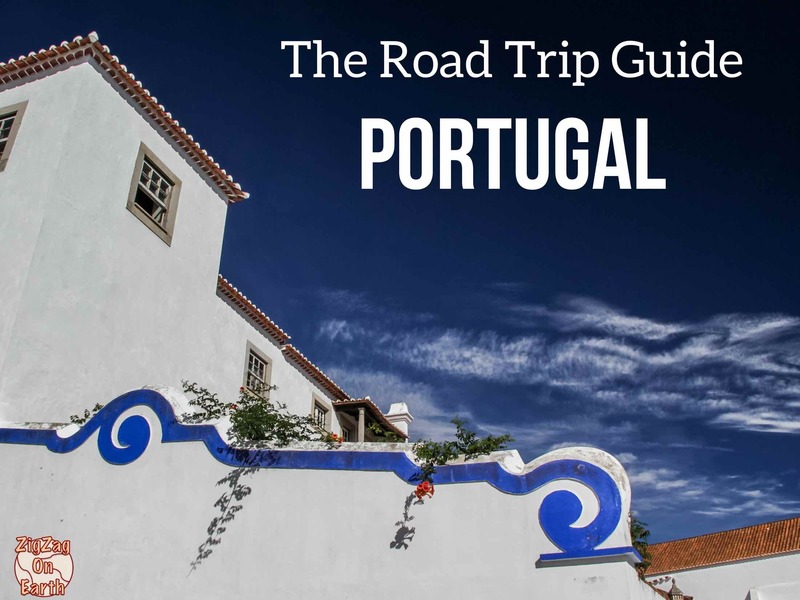 This location, along with many other beautiful places, is included in my eBook: The Road Trip Guide - Portugal. 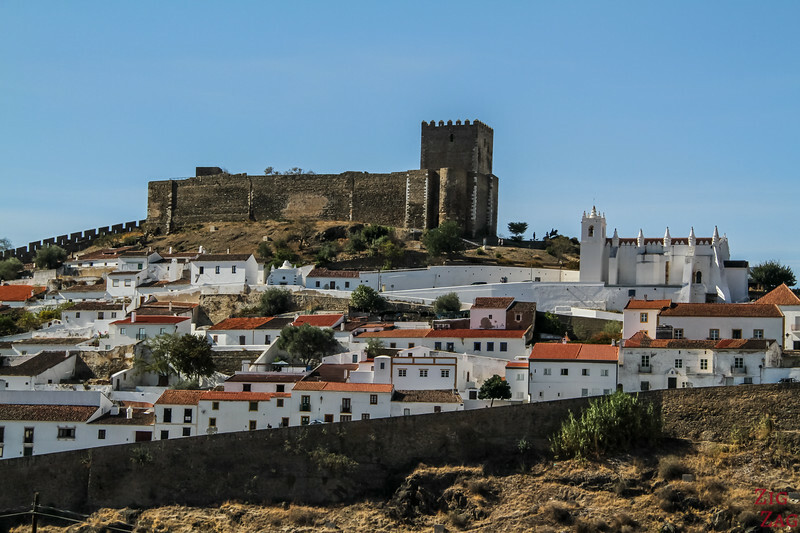 And at the top of the hill you can visit the Mertola Castle. 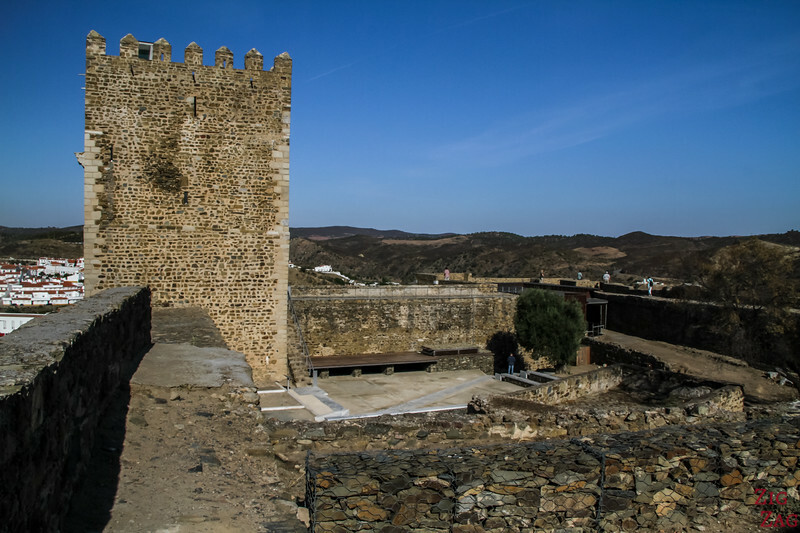 A fortification had already been built during the Islamic Period but only the base of few towers and the curved entry system remain. 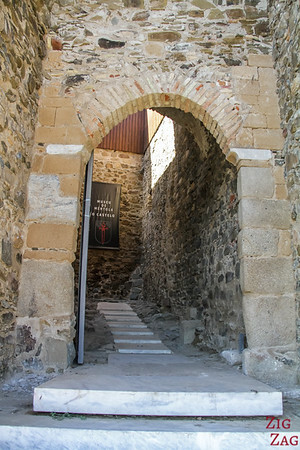 At the end of the 13th century, a Christian Castle was erected to establish the headquarter of the Order of Santiago and the residence of the governors. 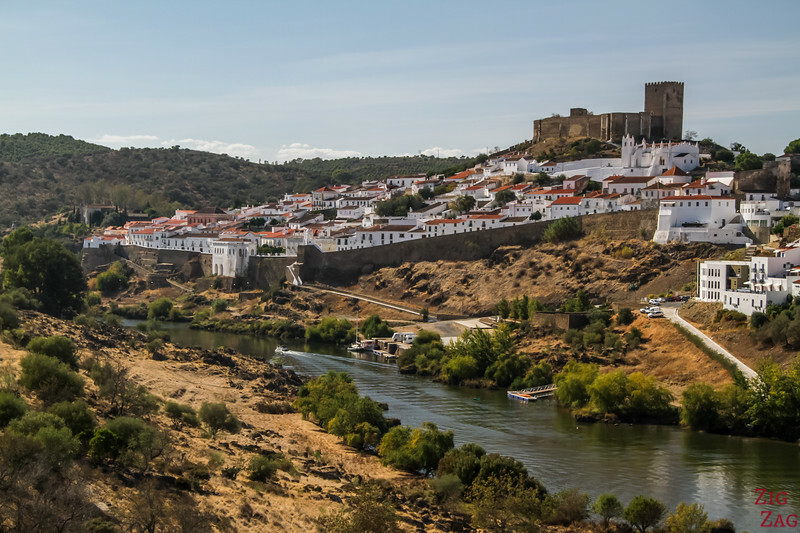 From the 18th century on, the castle lost its military function and was declared abandoned. 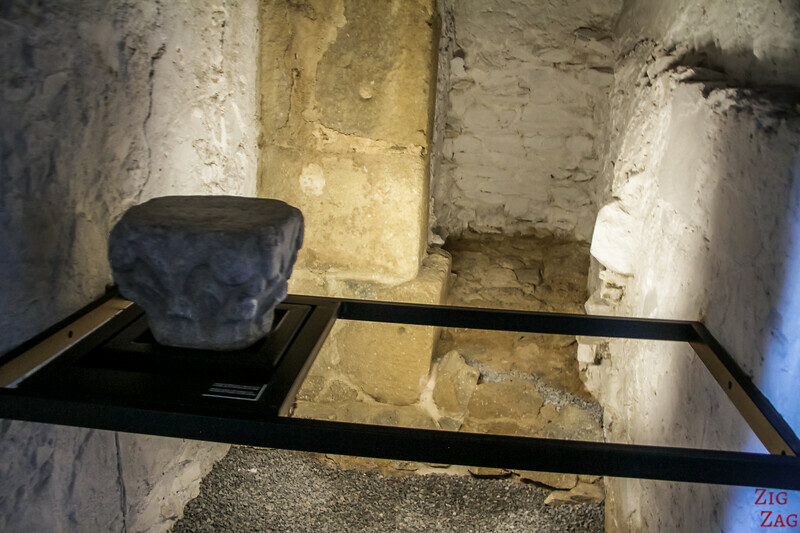 Today both the castle and the church are national monuments. 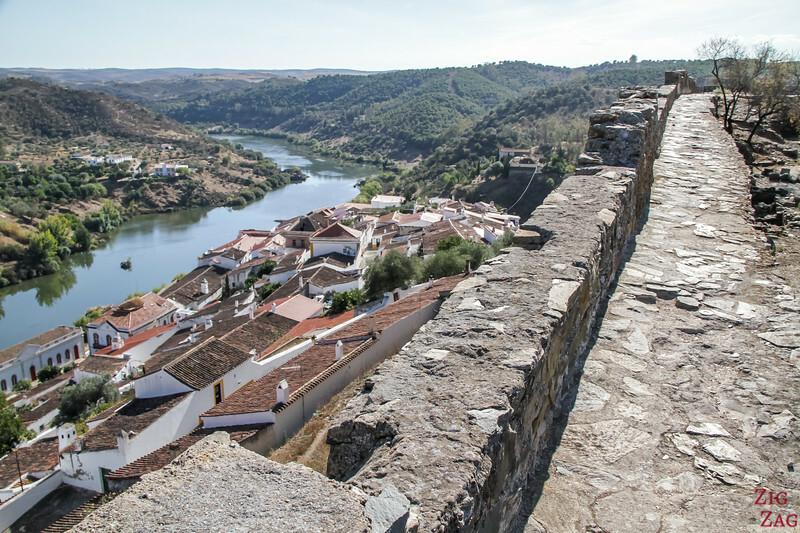 The best part of visiting the castle is to admire the views of the village of Mertola Portugal from above. 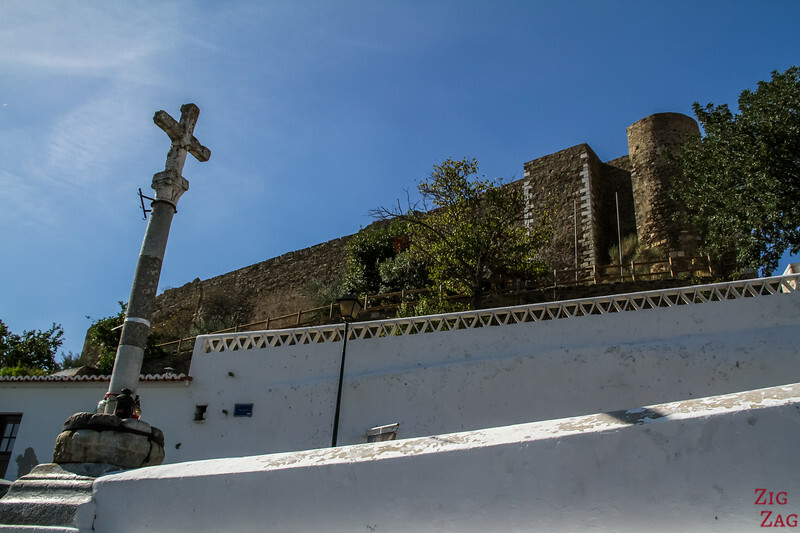 Here are a few pictures taken in various directions around the castle. 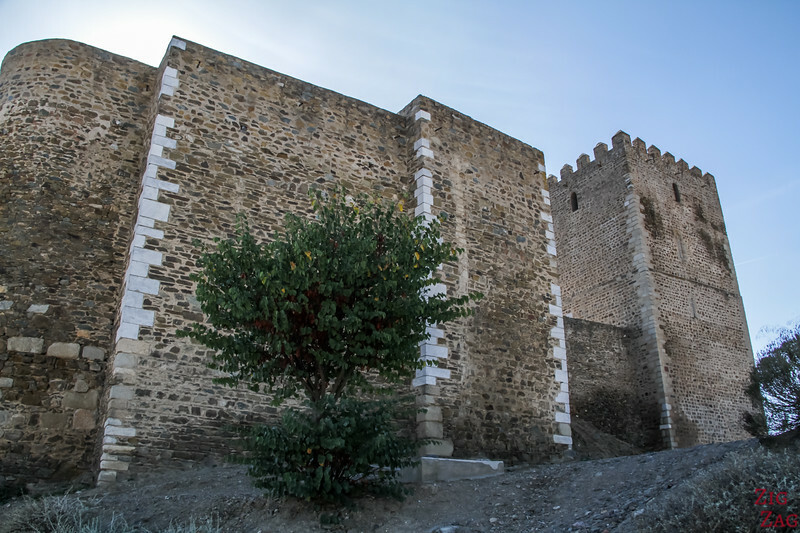 The Parking is part the entrance of the walled village. Continue on the road.